So, first post in awhile! I’ll start by apologising for the general appearance of these cupcakes. Yes, you can totally cut the end off of a ziploc bag and use it to pipe frosting, but the results will be, well – see for yourself! (What I’m really saying here is that I miss my cake decorating equipment.) Anyway, the chocolate cake in these is really, really super delicious, and I suppose you could substitute whatever frosting topping you want. 1. Preheat oven to 325 degrees F/160 degrees C. Line two cupcake tins with liners. (You might get slightly more than that – yay! I think this made about 28-30 cupcakes for me). 2. In a large mixing bowl, whisk together the dry ingredients, then stir in the butter, eggs, and vanilla until just mixed. Then, slowly stir in the coffee just until it forms a smooth batter. 3. Ladle into the cupcake tins, but fill them less than normal. You want the tops of the cupcakes to be below the top of the liner when they’re finished. 4. Bake for about 15 minutes or until a toothpick inserted into the centre comes out clean. While the cupcakes are baking, chill a bowl for the whipped cream topping. 5. Put the cupcakes onto a baking sheet. Spread a generous tablespoon of ice cream across the top of each cupcake and freeze for about 30 minutes. 6. Meanwhile, in the chilled bowl, beat the cream and confectioners’ sugar until stiff peaks form. Spoon the cream a pastry bag fitted with a large round tip (or a ziploc with the end cut off, if you live in a baking supply-deprived country). 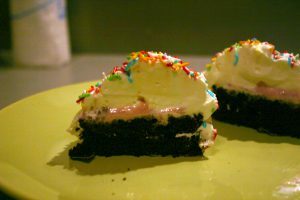 Remove the cupcakes from the freezer and pipe a swirl of cream on top of each one. Then return them to the freezer and chill until the cream is solid, about 45 minutes. 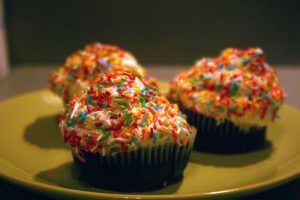 Finally, remove them and decorate with the sprinkles before serving! 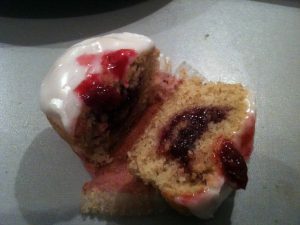 My obsession with the Bakewell tart is well-documented on this blog (I’ve made a tart AND some little baby tartlets). Well, on my new favourite television show, The Great British Bake Off, one of the contestants made Bakewell cupcakes. And I just couldn’t resist (also my friends weren’t familiar with the Bakewell magic, so I felt obligated to demonstrate). 1. Preheat the oven to 180C/350F/Gas 4. Line a 12-hole muffin pan with cupcake liners. 2. Beat the margarine/butter in a bowl until it is light and fluffy, then beat in the sugar. Beat in the eggs one at a time, followed by the milk and almond extract. 3. In a separate bowl, whisk together the almond flour, self-raising flour, and baking powder. Fold this into the margarine mixture. 4. Spoon the batter into the muffin tin, and bake for 15-20 minutes, until the cupcakes are golden on top and a skewer inserted into the centre comes out clean. Remove from the oven and let cool for 10 minutes. 6. Prepare the icing by whisking the icing sugar with the lemon juice. 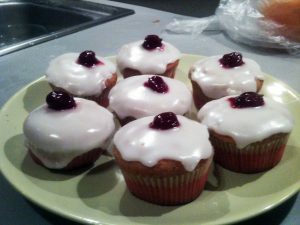 Spread a small amount on each cupcake and top with a cherry. I don’t really recall eating snickerdoodles growing up, which is a bit shocking as I love cinnamon. Probably the lack of chocolate turned me off to them. In any event, my first recollection of eating a snickerdoodle is over the summer, when I made them for the first time.? 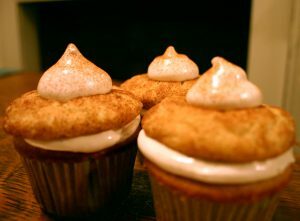 Last night, while engaging in my habitual reading-of-food-blogs-to-procrastinate activities, I discovered someone who mentioned making snickerdoodle cookies and snickerdoodle cupcakes and kind of gluing them together with some boiled frosting. What a fantastic idea! Here is my take on that. 1. Preheat oven to 375oF. Line a baking sheet with parchment paper. 2. In a medium bowl, sift together the flour, cream of tartar, baking soda and salt, and set aside. In a large bowl, cream the butter and sugar on medium for about 2 minutes. Add the egg and beat until combined. Then, add the flour mixture and mix until combined. 3. In a small bowl, stir the remaining 1/4 c of sugar with the cinnamon. Form dough balls about 1″ in diameter and roll in the cinnamon-sugar mixture until well-covered. Place on the baking sheet. 4. Bake for about 10 minutes, or until the cookies begin to crack on top. Remove and let cool on a wire rack. 1. Preheat the oven to 350oF. Line a cupcake tray with 12 liners. 2. In a medium bowl, sift together the flour, baking powder, salt and cinnamon. In a large bowl, cream together the butter and sugar. Beat in the eggs, one at a time, mixing well after each addition, followed by the vanilla. Add the flour mixture in 3 parts, alternating with the buttermilk in 2 parts (so you begin and end with the flour mixture. Mix until just combined. 3. Fill the baking cups until about 7/8 full. 4. Bake for about 17-19 minutes. Remove and let cool completely. 1. Combine the sugar, water and corn syrup in a small saucepan. Bring to a boil over medium heat, stirring occasionally until the sugar dissolves. Continue boiling without stirring until the syrup reaches 230oF. 2. Meanwhile, in a large bowl, beat the egg whites using an electric mixer with the whisk attachment on medium-high speed, until soft peaks form. Then, mix in the 1 tbs of sugar. 3. As soon as the sugar reaches 230oF, remove it from the heat. With the mixer on medium-low speed, pour the syrup down the side of the bowl in a slow stream. Raise mixer speed to medium-high and beat until the mixture is completely cool, about 8-10 minutes. Spread a layer of the frosting on top of a cupcake. Press a cookie on top. Garnish with another dollop of frosting, with cinnamon sprinkled on it. After a very long hiatus, I am back, in a new apartment (yay!) with an old kitchen (boo). When I was growing up, my mother, like most parents, wanted to make sure that I ate healthily. In most cases, this meant that I was not allowed to eat white bread. However, exceptions were made for a bit of heaven sold at the local ShopRite: rainbow bread. Rainbow bread is simply white bread, made with dyed dough, rolled together and baked normally, but the addition of colour increases its appeal (and apparently its parental approval rating) by tenfold. 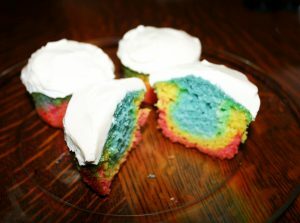 Rainbow cupcakes are the cake equivalent of rainbow bread: vanilla cupcakes with rainbow swirls. They’re no more difficult to make than regular cupcakes but have the added appeal of colour! In other words, they are absolutely fabulous. 1. Preheat oven to 350oF. Line a 12-cup muffin tin pin. 2. In a medium bowl, whisk together the flour, baking powder and salt. In a large bowl, whisk together the sugar, eggs, vegetable oil, buttermilk and vanilla extract. Pour in the dry ingredients and stir until just combined. 3. Divide batter evenly into 4 small bowls and add 10-12 drops of food colouring to each bowl to make red, yellow, green and blue batters. Stir well, so no streaks of plain batter remain. Add additional food coloring if necessary. 4. Starting with the one of the batter colours, add a small spoonful to each of the muffin cups. Repeat with each of the remaining colours, going in whichever order you like. Do not attempt to spread or stir the colours, but allow them to spread on their own to achieve the layered effect.